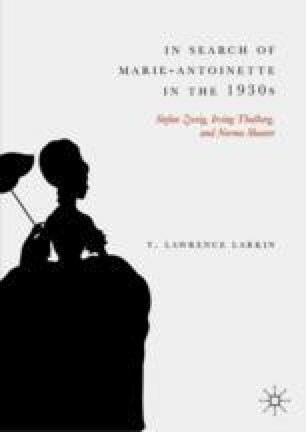 This chapter analyzes Norma Shearer’s intervention in the screenwriting process to transform Marie-Antoinette into a clever and romantic figure and her arduous preparation for playing the historical role before the cameras. It commences by situating Shearer’s biographical performances of the mid-1930s in relation to current trends in character identification and psychological penetration necessary for persuasive acting. It then discusses the actress’ close relationship to replacement producer Hunt Stromberg and oversight of the cost-saving substitute director Woody Van Dyke as responsible for the production quality of Marie Antoinette. The core discussion focuses on Shearer’s ability to deploy a full range of expressive talents to reinforce the Production Code’s required “punished profligate” narrative and to offer an independent subtext about the potential of women’s power within a patriarchal framework. Finally, it assesses critical and public response to her performance upon its premiere at the Carthay Circle Theatre on 8 July 1938. Bird, Christopher, and Kevin Brownlow. 6 September 2015. Garbo. Documentary Narrated by Julie Christie, Turner Classic Movies, https://www.youtube.com/watch?v=cmdmjtei8A4. Accessed 1 March 2016. Metro-Goldwyn-Mayer. 1931. The Christmas Party. Short Subject Film Starring Norma Shearer and Jackie Cooper. https://www.youtube.com/watch?v=ir8cBbthCf0. Accessed 6 April 2016.